Let me begin by saying: These are different. Not only are they marketed differently, but they perform differently on the lips as well. To be more precise, I find the different shades in the own brand vary in formula and finish as well. So, please don't think these are close dupes as I compare them side by side. I put these together in 1 post just because they are very, very similar in packaging. 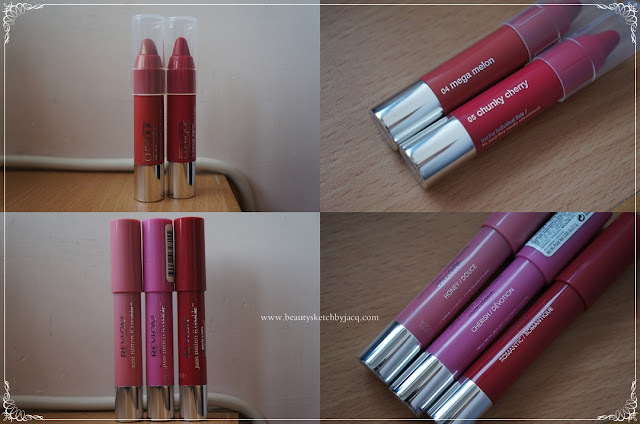 Clinique, Chubby Stick Moisturizing Lip Colour Balm. I have the shades #04 Mega Melon and #05 Chunky Cherry. Highly adore and appreciate the alliteration in their naming! Both of these are gift with purchase sizes, which I obtained them from local beauty stores (Aster, it is). Revlon, Just Bitten Kissable Balm Stain. I have the shades #001 Honey, #015 Cherish and #045 Romantic. They are sold at HKD $98 (USD $12.6) and currently on promotion for HKD $78 (USD $10). Still, this is way more expensive than what you need to pay for in the States! Mega Melon is a very natural beige with hint of orange. Not an easy shade to describe. It has some very fine shimmer/frost in it. Honey is a medium mauve pink. It is basically satin, with a hint of pearl finish. Cherish is a pastel pink, with a lot of white and blue tones showing through. It applies very thickly and I'm sad to say it leans on the chalky side. Romantic is a red. It has slight brick or orange tone in it. Still sheer and not too grown up. The balm texture on this is the best out of the 3 I own. Revlon on the left, Clinique on the right. Origin: Clinique made in Canada, Revlon made in USA. Moisture: Both are very good. I can apply both on dry bare lips and not feel uncomfortable. Clinique does have more balm/gloss feel to it, so I will say it is more moisturising. 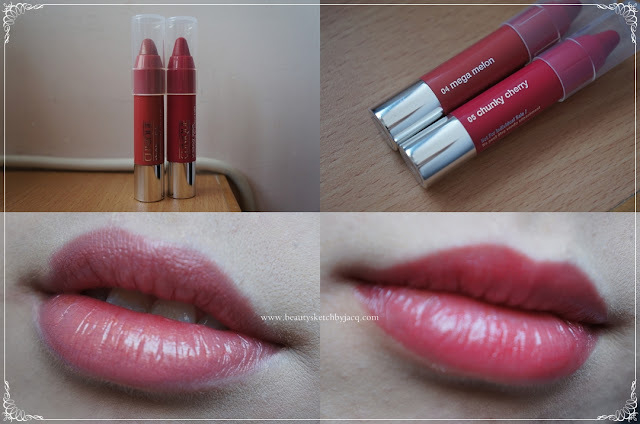 Revlon gives a more "moisturising lipstick" feeling, which is smooth and perfect initially. Throughout the wear, the Clinique feels more comfy compared to the Revlon. Scent: Clinique is fragrance and scent free. Revlon has a rather strong mint scent, which is gone in a few minutes, at most 10. I can't tell which mint it is, but I can tell I don't like it! Pigmentation: Revlon definitely pays off more, on hand and on lips. It can cover my medium-pigmented lips. totally. Clinique is semi-sheer. Lasting power: Both are decent. Stain: Clinique almost doesn't leave a stain, perhaps a faint one for the Chunky Cherry. Revlon, on the other hand, all leaves quite a distinct stain. However, the pinks do not leave the same shade of pink stain when they fade. That is, the stain differs from the balm colour. For natural everyday colour, I'll go for Revlon 001 Honey. A beautiful pink that flatters my complexion. 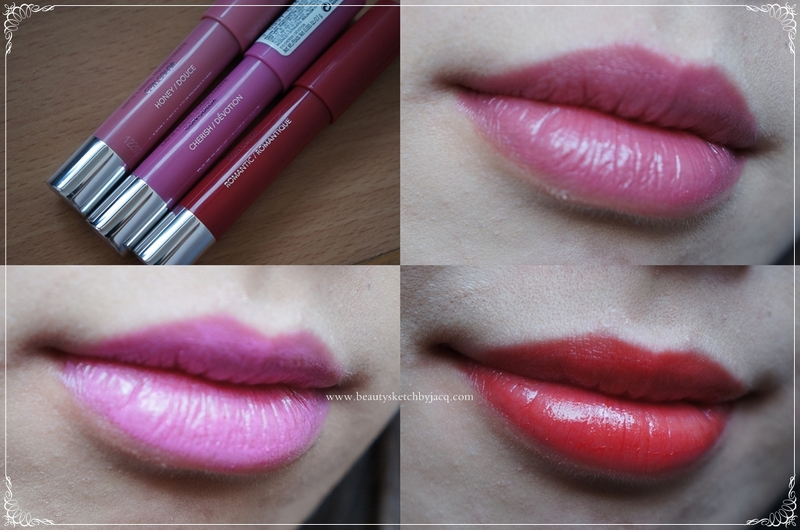 For a brighter, 'statement' lips, I'll go for Revlon 045 Romantic. It is really red, and really easy to wear in terms of red lips. Not too high-maintenance I'd say! Yea Yea. I have had the chubby stick in mega melon for a few months and I have only wore it out twice. They are comfortable but not phenomenal. The Revlon, on the other hand, has been on my lips and in my handbag since I got them, every day! I have honey and sweetheart and now want cherish! It looks lovely:) let me know if you want me to send you crush:) I'd be glad to! yes! !i wish the shade crish will land hk!! !it is a color perfect for fall!!! !